The special date of 12-12-12 saw more than 30,000 Chinese couples tie the knot in a matrimonial and optimistic “yang” to this month’s supposed Mayan “yin” of doom forecast for Dec. 21. Some couples braved heavy snow or stood in line for hours to receive their marriage certificates, and willing bureaucrats worked late so people could make an auspicious start as man and wife. 12-12-12 is a rare date that only happens once in a century. It will be another hundred years before the same sequential year, month, and day can be experienced. In China, 12 is believed to be a significant lucky number. Since timekeeping emerged in human history, the 24-hour clock has a cycle of 12 hours. The Chinese zodiac is composed of 12 animals, each symbolizing a lunar year. In Western astrology, there are 12 astrological star signs of the zodiac in a cycle. Mainland Chinese call it “World Love Day.” This triple 12 day is considered favorable for young lovers, who hurried to marriage registration offices to receive their certificates, hoping this special day would bring them good luck. Mr. Ni and his bride-to-be were first in line at a marriage registration office in Beijing’s Chaoyang District around 7 p.m. the previous evening, according to a report by Legal Evening News. 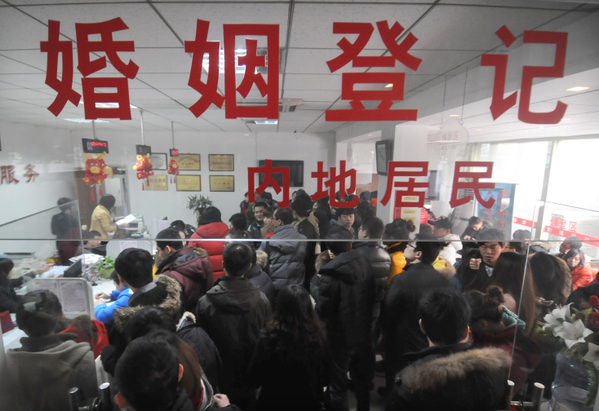 Marriage registration offices in the districts of Xicheng, Chaoyang, and Haidian in Beijing were swamped. The Haidian office even had to extend its working hours until midnight to ensure every couple got their matrimonial certificates that day, the report said. As of 5 p.m., 7,690 couples in the capital had vowed to “must love,” nearly double the number who married on Valentine’s Day, according to the Beijing Morning Post. Hebei Province had a record number of 13,121 couples registered for marriage that day, four times more than the average number of daily marriage registrations, Yanzhao Evening News reported. The number of marriage registrations always peaks on triple-digit wedding dates, with 15,000 couples on Aug. 8, 2008, 19,000 on Sept. 9, 2009, 11,200 on Oct. 10, 2010, and 5,200 on Nov. 11, 2011, according to the Legal Evening News report. The number 12 holds particular meanings in various myths and religions, and the human body is also linked with the number 12. In Greek mythology, the 12 main gods in the Pantheon are called “The Olympians.” Cupid, commonly depicted as a young boy with bow and arrow, is the son of Venus. In Christianity, the 12 disciples of Jesus were called the twelve apostles. In Buddhism, the Twelve Nidanas are an interpretation of the central concept of the teachings, relevant to karma and rebirth. Twelve is a common number in Buddhism, such as the Twelve Heavenly Generals of the Medicine Buddha. Amazingly, the human body is related to the number 12 as well, with 12 pairs of cranial nerves, 12 thoracic vertebrae, 12 pairs of thoracic nerves, 12 internal organs, and 12 opening orifices (tongqiao).